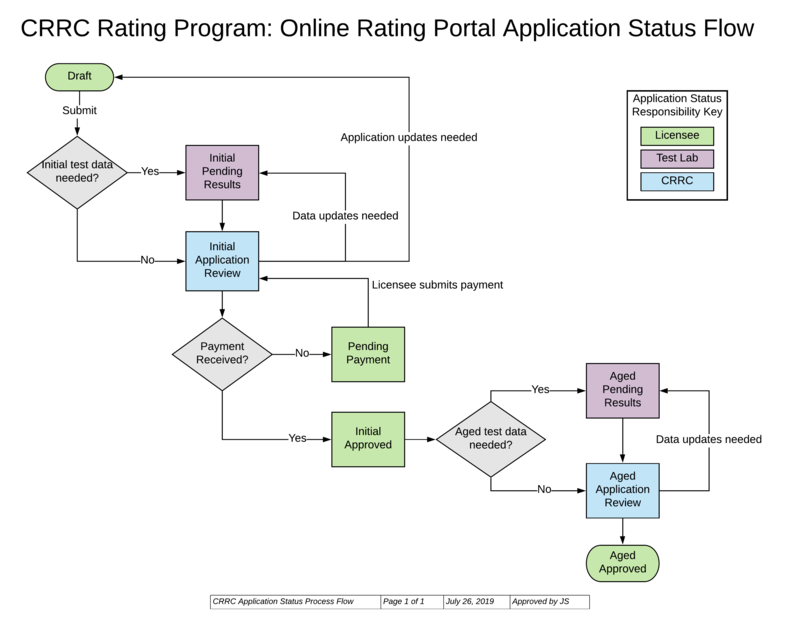 The CRRC Online Rating Portal, or what we call “The Portal,” is the new and improved way to submit and manage product rating applications, including ENERGY STAR® certification. You can also pay fees and annual renewals through the Portal’s invoicing function. 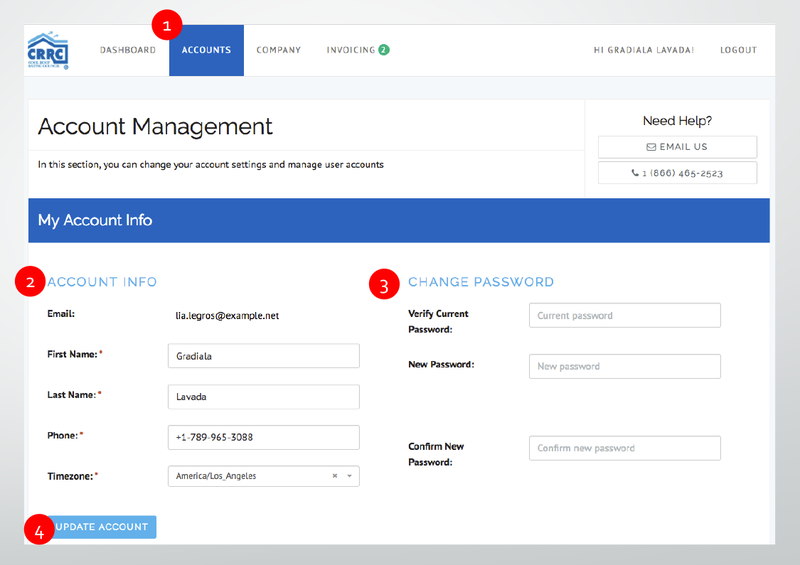 This user manual is a brief introduction to the Portal and includes instructions for logging in, setting up accounts for staff members in your company, using the dashboard, submitting a product rating application, and generating and paying invoices. Licensees and Labs are both on the Portal, so no need to send test results around. Everything is entered directly online! Simply select which Lab and Test Farm you will be mailing your products to and they will be granted access to enter test results on your rating application. Don’t worry, you can review test results before CRRC processes your application. CRRC will only approve applications that have initial test results and paid application fees. See the Application Status Flow diagram at the end of this document. If an account has been created for you, you will need to claim it by setting a password. Enter the email address where you received your new account notification. You will receive a second email with a unique link, click on it and set your password there. Now you are able to log in using your email address and password. 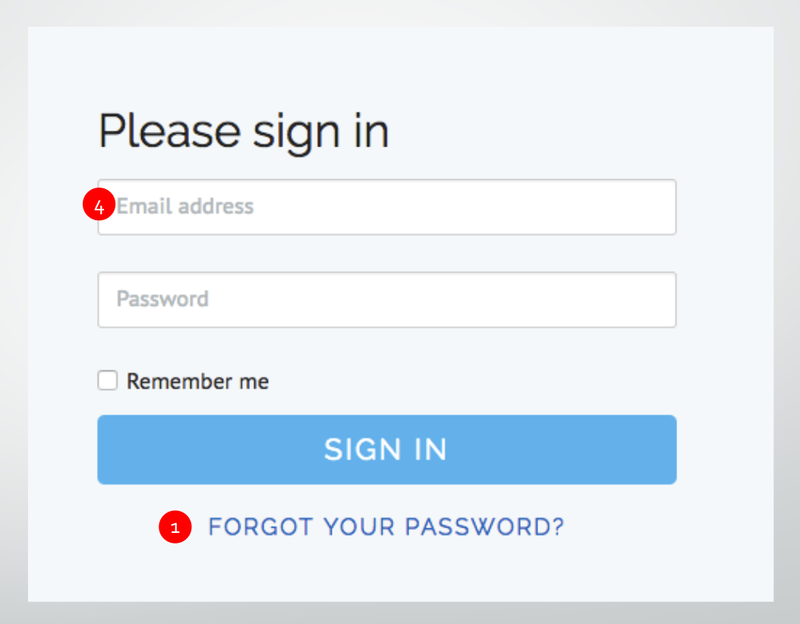 You can use this link any time you forget your password in the future. Navigate to “Accounts” in the top menu. 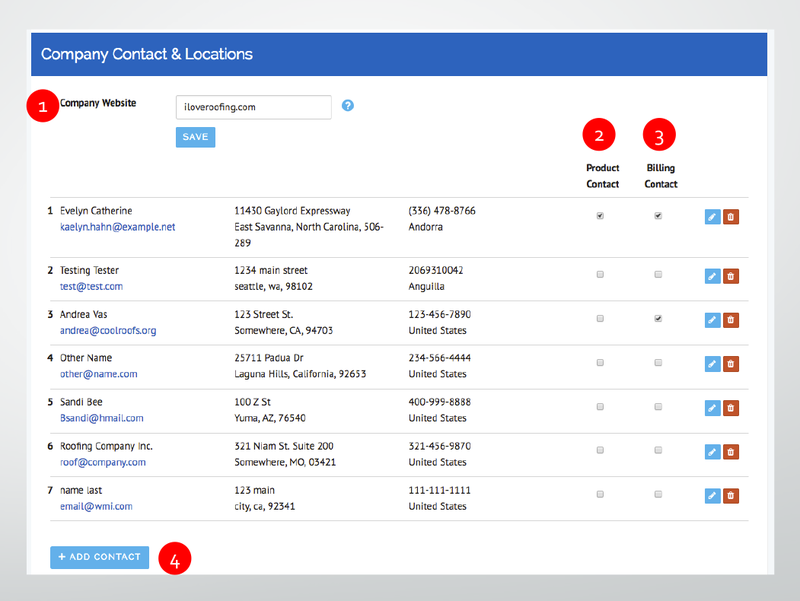 Add or edit your contact information. Email addresses are used to login, so this cannot be changed. If you have changed your email, please set yourself up with a new account (see Manage Company Users). You may also change your password here, or leave it blank if you do not want to make changes. Click on “Update Account.” You will see a green bar letting you know that your changes have been saved. Only administrators can manage company users. All user accounts in a company have access to all product information submitted by anyone in the company. Add a new company user by clicking on “+ Add User.” You will need to provide the email address where they can receive an account invitation. This email address will become their login. Select which users have administrative rights. At any time, you can help a user reset their password by clicking on “Reset Password.” Or delete users who should no longer have access. You may also revoke a previously sent invitation if you have made a mistake. Navigate to “Company” in the top menu. Licensee status is considered “Active” if the account has paid annual dues. Failing to pay dues through the Invoicing page may result in deactivation of Licensee status. Click on “Become an EPA Partner” to establish an ENERGY STAR® partnership. 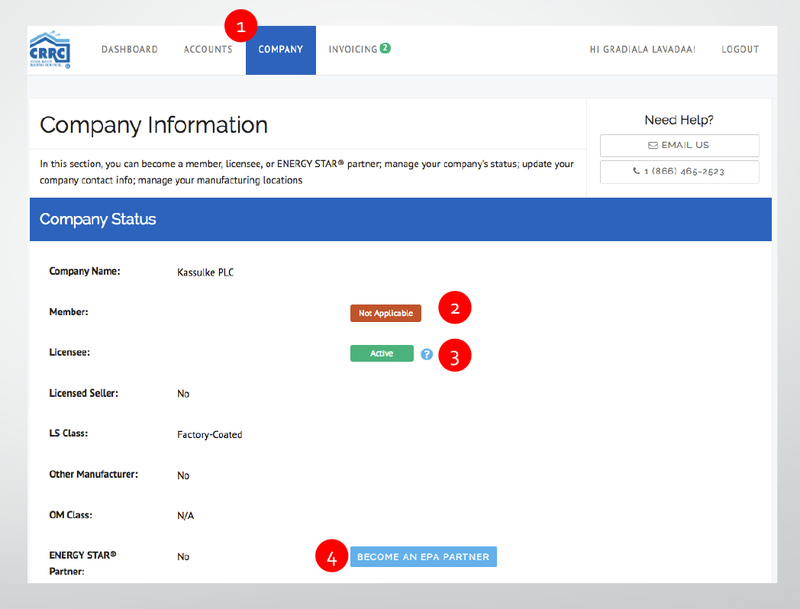 Administrators can manage company information, such as Company Website (1), product contacts (2), and billing contacts (3). You can access your existing applications or create new ones from the Dashboard. Navigate to the ”Dashboard” from the top menu. Click on green “+ New Application” button to begin a new product rating application. Existing applications in your company are listed in the dashboard and can be accessed by clicking on the blue ID tag, or the pencil icon, which looks like an eye when the application is in a read-only status. The dashboard can be filtered using the filtering options. 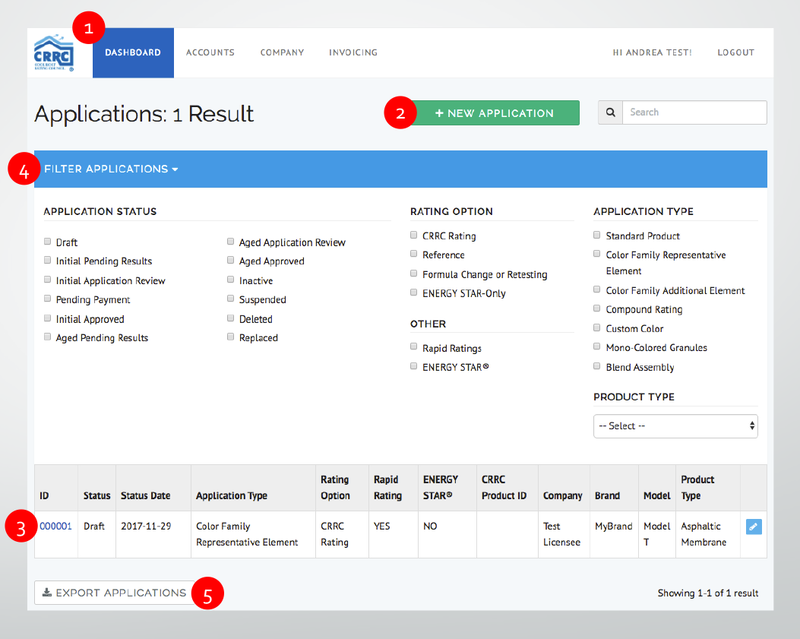 You can also export a complete list of all of your product applications by clicking on “Export Applications” at the bottom left. 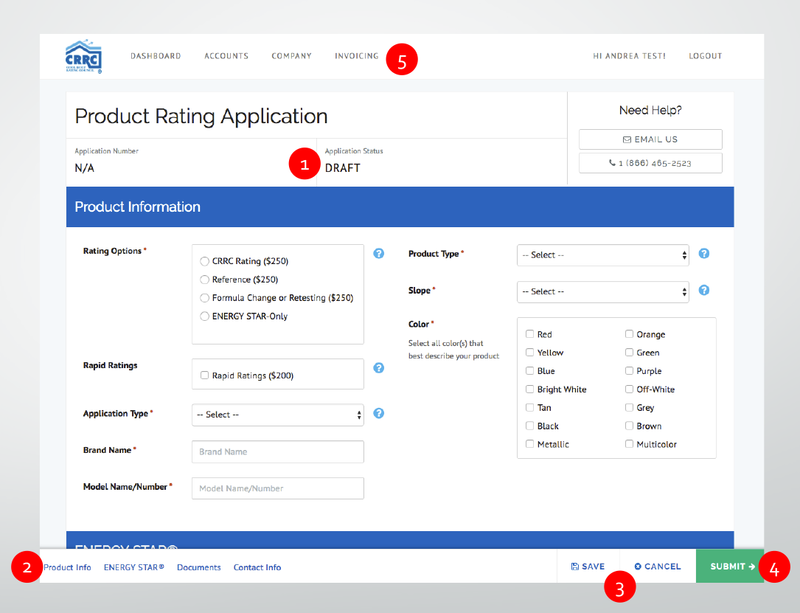 A new product rating application will start in a “Draft” status. All fields marked with a red asterisk (*) are required. Click on the blue ? icon to display helpful information about the field. Keep scrolling and provide answers to all four sections of the application: Product Information, ENERGY STAR® (if applicable), Documents, and Contact Information. You can Save the application at any time before you are ready to submit and come back to it later. Or you can cancel your changes without saving. When you are ready, click the green “Submit” button on the bottom-right. You will be asked to provide your name and account password as signature in order to submit the application. The application will not be reviewed until fees due are paid through the Invoicing page. 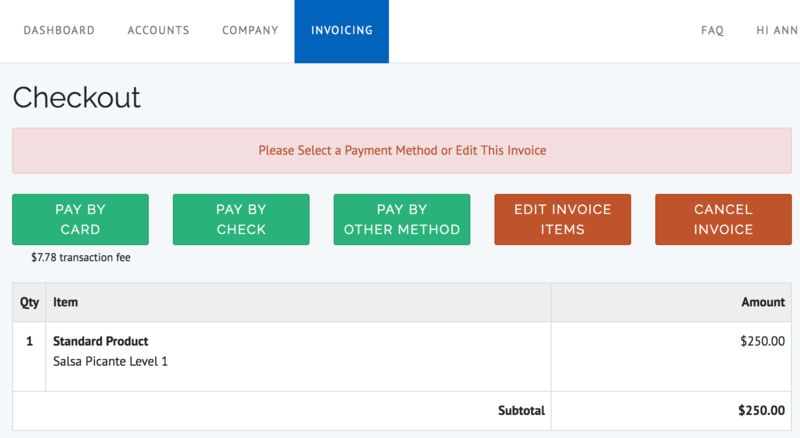 The Invoicing page allows you to create invoices for the unpaid items you wish to pay for. 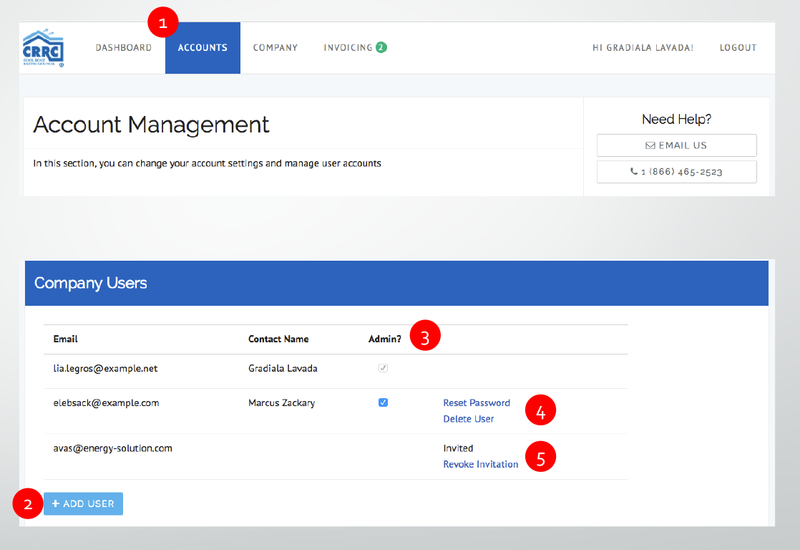 Navigate to “Invoicing” from the top menu. The green number indicates how many unpaid items your company has generated. Click on Generate Invoice. 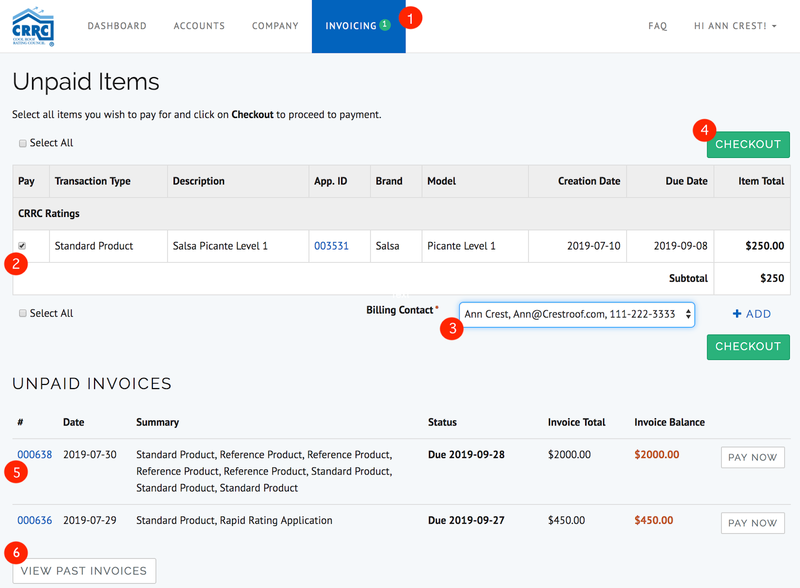 See the Paying an Invoice section for payment instructions. All unpaid invoices are listed below the unpaid items. You can view past invoices by clicking the “View Past Invoices” button. All unpaid items need to be added to an invoice. You may print this invoice using your browser’s print function. You must designate a billing contact on each invoice. When you are ready, you have a choice to pay by card or other forms of payment, such as a check. Note that payments may have an additional transaction fee. If you choose to pay by ”Other” method, you will receive an email reminder with a copy of the invoice for your records. The invoice will not be considered paid until the payment is received by CRRC. This diagram represents the status flow of applications as they move from the initial draft status, through the various test results, and finally end at Aged Approved after the three-year aging process. A green status is where the Licensee has primary responsibility to provide information, purple is when Laboratories are required to submit test data, and blue indicate CRRC review statuses.